Download the pdf version of this Campus Snapshot here. 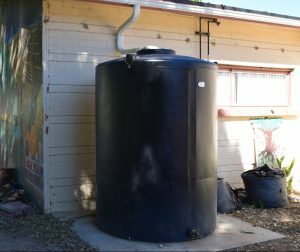 California State University Northridge (CSUN) installed a 850 gallon water cistern during the summer of 2018 at the Chicano House on campus. All plumbing and rooftop gutters were installed at the same time. With every inch of rainfall, CSUN now has the potential to capture 1,000 gallons of water. The water captured in this cistern will supplement irrigation water used at the Chicano House’s food and medicine garden. The cistern also offers the opportunity for campus and the surrounding community to learn about water conservation, water rights and privatization of water, environmental and social justice, and food gardening. 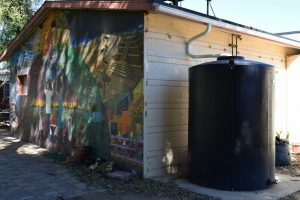 The water cistern was installed at the Chicano House on campus. As open space is limited at CSUN, identifying and securing a location for the cistern was more challenging than anticipated. The water cistern was ultimately installed at the Chicano House on CSUN’s campus. This local was chosen partly because, unlike most academic buildings, the Chicano House mimics a residential home, so it offers campus and community members the opportunity to see what such a cistern would look like if installed at their homes. In addition, this site was selected because of the roof size. This project was funded through an external grant as an engagement strategy for resilience planning. The CSUN Institute for Sustainability was responsible for implementing the project, with assistance from the Physical Plant Management. The impact of this project will be measured by the volume of water captured by the cistern. CSUN’s initial resilience assessment identified extreme heat as a climate change hazard, infrastructure failure and poor air quality as climate change impacts, and inadequate infrastructure and food insecurity as factors that will be exacerbated by climate change. During campus-community workshops hosted as part of the resilience assessment, participants similarly identified environmental risks related to water and food as key concerns. We invite you to learn with us through our blogs, newsletters, and events designed to help you accelerate climate and sustainability innovation. Second Nature Inc. All rights reserved. © Second Nature is a Commonwealth of Massachusetts nonprofit public benefit corporation, and a tax-exempt charitable organization as described in section 501(c)(3) of the United States Internal Revenue Code.